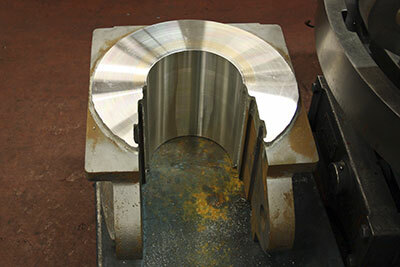 Barnshaws Plate Bending in the West Midlands have supplied the two sections of boiler barrel. The joint in both pieces has been submerged arc welded. The larger of the two units is an eccentric cone, that is the bottom of the completed barrel will be parallel whereas the top will be tapered. One of the first jobs will be to swage the small end of the eccentric cone parallel for a distance of 5 3/8” in order that the short parallel barrel section can be fitted inside and the two then riveted together. 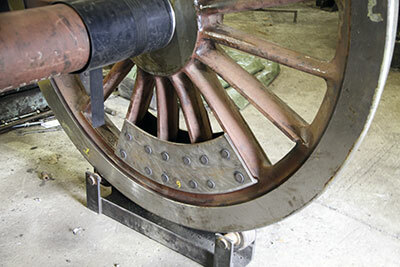 The larger end of the eccentric cone also has to be swaged parallel for it to fit into the throatplate of the firebox. 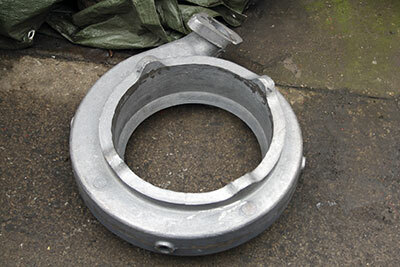 The Boro’ Foundry have produced a new chimney and vacuum ejector exhaust ring. Both await machining. The cab has received a lot of attention in recent weeks. 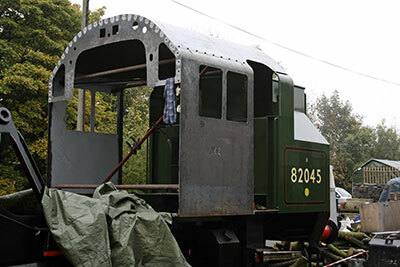 It has been on the chassis for positioning and alignment checks plus marking out of various holes and fitting the bulkhead behind the driver’s seat and the smaller one behind the fireman. The cab is now on the ground, partially dismantled for drilling and welding work and for fitting the sliding ventilator in the roof. All the work on the cab has meant that work on the smokebox has taken a temporary back seat, although the dart and locking handles for the door have been machined. 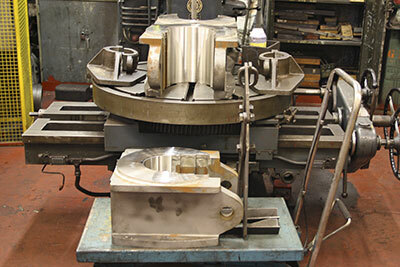 Machining of the whitemetalled surfaces of the coupled wheel axleboxes is in full swing. At the time of writing these notes there was an axlebox being machined on the vertical borer with another one receiving attention on the slotter. The latest issue of Steam Railway carried a feature-length article about the project. This had been written some time earlier but we hadn't envisaged its appearing so soon. Howard Johnston, the magazine's editor, rang Chris to ask if we would be happy for it to be published. Unfortunately, there was insufficient time to arrange for an appeal insert to go in the mag, but we will be making up for this early in the new year. In the meantime, we are pleased with the excellent job Howard made of the article, and indeed with the consistent coverage Steam Railway gives to 82045. This has been very successful to date. Currently on offer are the two combination levers (these connect the radius rod to the crosshead via the small union link to synchronise valve and piston movement) at £1,750 each. One of the above-mentioned union links is also available (we have an offer of sponsorship for the other) at £600. Please get in touch with Chris if you are interested in any of these items. Don't forget - Saturday 9th April at 2.00 p.m. in the upstairs Lecture Theatre at Kidderminster Railway Museum. It seems an age away in dreary late November, but it will soon be upon us. Roll on spring! 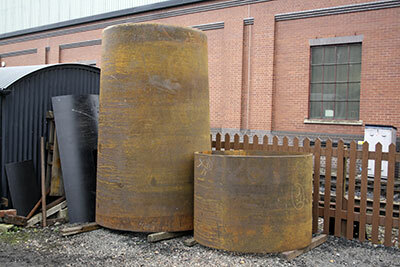 The two sections of the boiler barrel delivered to Bridgnorth. Photo: Tony Massau. The newly cast chimney. Photo: Tony Massau. The vacuum ejector exhaust ring casting. Photo: Tony Massau. The cab in situ. Photo: Tony Massau. The axleboxes in the machine shop. Photo: Tony Massau. A newly machined axlebox. Photo: Tony Massau. 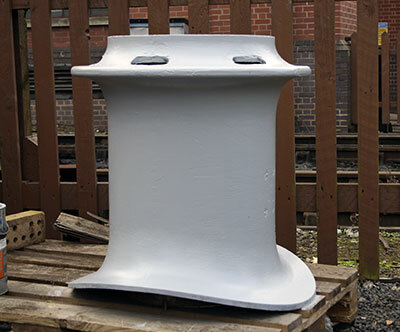 The support plates for the balance weights on one of 82045’s coupled wheels at Buckfastleigh. Photo: Chris Shields. 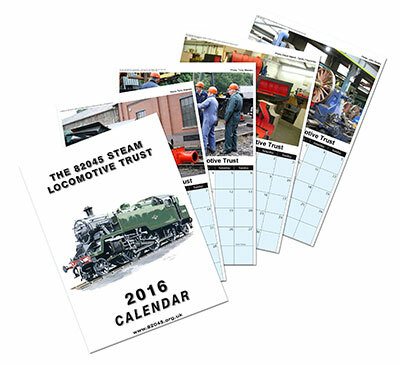 Our new calendar is now available and this time features our own locomotive '82045' in various stages of development. In full colour, the cost is £6.00 + £1.20 p&p and is available from Barbara.